Nominations are being accepted for the Chemical Corps Regiment Honors Program for Hall of Fame and Distinguished Member of the Corps. Hall of Fame: This award is extended to chemical, biological, radiological and nuclear personnel (living or deceased) who spent their professional careers serving the Chemical Corps in an exceptional manner or who performed a significant act of heroism. Nominations are open to military and Department of Defense civilian personnel who have been retired from active federal service for at least 2 years. Their service to the Corps must have been extraordinary. All packets must arrive before February 13th. For more information, call (573) 563-7339 or e-mail christy.lindberg@us.army.mil. Nominations are being accepted for the Chemical corps Regimental Association (CCRA) Distinguished Member of the Corps Honors. All packets must arrive before February 13th of the current year. For more information call (573) 563-7339 or email christy.lindberg@us.army.mil. The Order of the Dragon (OOD) Program consists of three Awards. These awards are the Ancient Order, the Honorable Order, and the Carol Ann Watson Spouse Award. 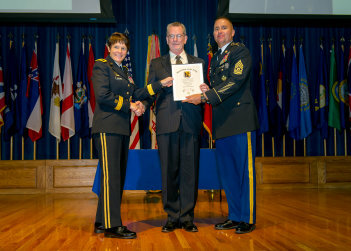 The CCRA gives these awards to recognize “Dragon Soldiers” (and their spouses) who have demonstrated the highest standards of integrity and moral character, an outstanding degree of professional competence, and have contributed to the promotion of the Chemical Corps in numerous ways over the course of their career. NOTICE: Effective February 8, 2017, the nomination and approval criteria for the Order of the Dragon Program has changed! Please review the criteria for each award before nominating or approving and award. By exception the Chief of Chemical may approve the OOD for individuals the do not meet the specific criteria of the award types above if the Chief of Chemical deems that the individual has provided conspicuous service to the Chemical Corp and the CCRA. The CCRA Board of Governors may approve special accouterments for selected individuals as they deem necessary and appropriate. Individuals awarded the OOD are responsible for purchase of their accouterments. Every effort should be made to present award of the OOD to individuals in a suitable ceremony. Army Blue or Army White Mess Uniform: The Order of the Dragon medallion will be worn with the ribbon around the neck, outside the shirt collar and inside the coat collar. The medallion will hang at full length of the ribbon. Army Blue, Army White or Army Green Uniform: The Order of the Dragon medallion will hang with the ribbon around the neck, outside the shirt collar and inside the coat collar. The medallion will hang over the four-in-hand necktie near the collar and above the top button of the coat or just under the bow tie near the collar and above the top button of the coat. Proper positioning may require pinning the ribbon together approximately three inches from the ends. The medallion will be worn with the dragon facing out and in view. The Order of the Dragon may be worn at any official Army, Service, or Department of Defense event or occasion, or other specific event or occasion approved by the Chief of Chemical. Males: Men will wear the medallion around the neck with the ribbon over the shirt collar and inside the coat collar. Whether worn with a bow tie or four-in-hand tie, the medallion will hang at the full length of the ribbon. When the four-in-hand tie is worn, the medallion will hang over the tie. Females: The Carol Ann Watson Award is designed to be worn on a ribbon or as a broach. Ladies may wear the award either around the neck with it hanging at the full length of the ribbon or as a broach and appropriate for their specific gown or dress. The MG William L. Sibert Award is an award program that gives recognition of excellence to the best Chemical, Biological, Radiological, and Nuclear (CBRN) Company or Chemical, Biological, Radioligical, Nuclear, and Explosive (CBRNE) Company in the Active Component (AC), Army National Guard (ARNG), and United States Army Reserve (USAR). 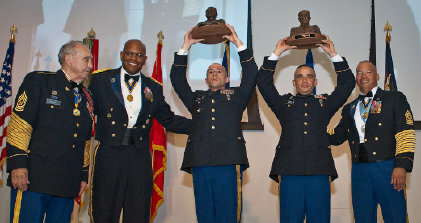 The award’s objective is to instill pride and reinforce essential elements of mission readiness, leadership, discipline and organizational excellence in a quality force. The US Army Chemical Biological Radiological and Nuclear School (USACBRNS) will select the best CBRN or CBRNE unit from the AC, ARNG and USAR component, in order to recognize the unit with the highest standards of excellence. To plan and execute a competition for chemical soldiers and NCOs that will test both technical and tactical skills along with common soldier knowledge. The intent of the competition is to challenge the competitors both technically and tactically; assess which of them is best and ensure that proper recognition is given. Dragon’s Peak will consist of different events completed at home station. Scores will be given for each event, and the total score will determine the winner. APFT and Weigh-in: Soldiers will be weighed in and given an APFT in accordance with regulation. The score earned during the event will convert to a point scale (ANNEX A) and added into the final score. Soldiers not meeting minimum standards will be dropped from the competition. Weapons qualification: Soldiers will be given one M-16 and 12 rounds to zero. Soldier must fire on a qualification with the zeroed weapon and be awarded points for the score attained (ANNEX A). Failure to meet the minimum standard will drop the soldier from the competition. Written Test: Soldiers will be tested to assess their knowledge of various NBC topics. The score received will convert to a point scale and will be added to the final score (ANNEX A). Failure to reach a minimum of 70% will drop the soldier from the competition. Note: This test will be administered On-Line timed and proctored by unit commander or 1SG. Only soldiers submitted for competition will have access to the test web site. The test will automatically forward to the USACBRNS and will not be part of the final packet. CTT: Soldiers will complete Common Task Training for the appropriate Skill Level. Failure to achieve a 1st time GO status in all tasks will drop the soldier from the competition. USACBRNS Proponency Office, (573) 596-0131 ext 3-7374. In an effort to show our appreciation and support for our Dragon Soldiers and their families, the CCRA sponsors a scholarship program named in honor of SGM Paul Cockman. The application criteria are outlined below. Please adhere to all deadlines in an effort to process the scholarships in a timely manner. The SGM Paul Cockman Scholarship Program awards scholarships to spouses and children of CCRA members. The term “children” in this program is defined as follows: natural or legally adopted children, stepchildren and legal wards. More than one family member may apply, however each applicant must submit an individual application with supporting documentation. Applicants must be enrolled at accredited post-secondary schools. All schools must be accredited by a regional or national accrediting agency recognized by the U.S. Secretary of Education. Children must be full-time students, spouses may be enrolled as part-time students. The program will award non-renewable scholarships for full-time and part-time students. The number, as well as the size of the scholarships may vary from year to year. The students may be enrolled, or planning to enroll, in an accredited college or university in a program of undergraduate studies. Contributions to the CCRA to support this program are welcome from corporations, individuals, and chapters under the rules and conditions established by the Board of Directors. Contributing companies, individuals, and chapters will be identified in CCRA publications. The CCRA corporate contribution policy does not permit corporate or individual funds to be directed to any individual or region. The contribution policy is strictly enforced to maintain the highest ethical standards for contributors and recipients. Please fill out all applicable information on the attached application. Please print or type all information NEATLY using black or blue ink. Write an essay about why you deserve to receive a SGM Paul Cockman Scholarship and what factors have influenced you to pursue a college degree. Demonstrate your talents by writing about any special interest or special circumstances that you would like the selection committee to consider. Please include any other attributes which you feel are pertinent to the committee, such as evidence of leadership, and/or community service, etc. Only one (1) essay is needed. One page, double- spaced with 1” margins. The essay should be 500-750 words. Use your name, date, and school name as the essay Title. Please include 1-2 professional or educational letters of recommendation. Please ensure that each recommendation is signed by the recommender. Please return the following 2 application pages completed along with your essay and your recommendations. Mail your application and essay to the below address, no later than March 1st. Applicants with postmarks after March 1st will not be accepted.